Emaar Properties ‎@MyDowntownDubai, one of the largest real estate developers in the United Arab Emirates, has a presence in 36 markets across the Middle East, North Africa, Pan-Asia, Europe, and North America. It is best known for large-scale projects such as the Burj Khalifa, the tallest building in the world. For New Year’s Eve 2018, ‎@MyDowntownDubai presented ‎#LightUp2018, a laser show projected onto the Burj Khalifa. The developer wanted to bring this spectacular event to life beyond Dubai, enabling people around the globe to be inspired by the show, the building, and the city itself. Having successfully live streamed its 2017 show on Twitter, it planned to go live again, and it set a three-phase strategy to ensure maximum engagement and views. 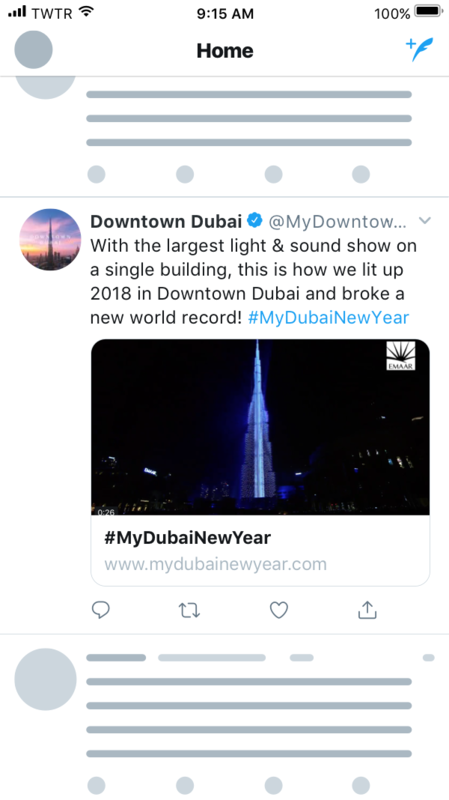 To build awareness and excitement in advance of New Year’s Eve, ‎@MyDowntownDubai launched a ‎#MyDubaiNewYear engagement campaign, running Tweets with GIF teasers of the show as well as a “Retweet to Remind” format, through which people could receive reminders minutes before the show began. 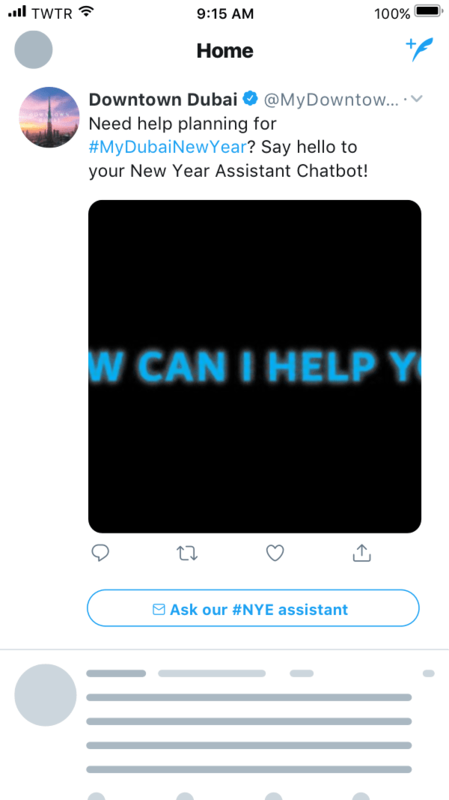 Using a Direct Message Card, it also offered a unique chatbot to help people make the most of the event. On the night of the event, an audience of 1.5 million viewers was able to experience ‎#LightUp2018 on Twitter, as it happened in Dubai. The live stream transformed Downtown Dubai’s celebration into a global event. To maintain buzz after the show, ‎@MyDowntownDubai ran a Video Website Card campaign highlighting the best moments of the show, and launched a follow-up feature in its chatbot: people could send New Year’s greetings, to their friends and followers. The official account of Downtown Dubai by Emaar. Follow us for updates on Burj Khalifa, The Dubai Fountain, The Dubai Mall, and much more. ‎@MyDowntownDubai used a variety of formats to set the tone for ‎#LightUp2018, building excitement in advance of the event. 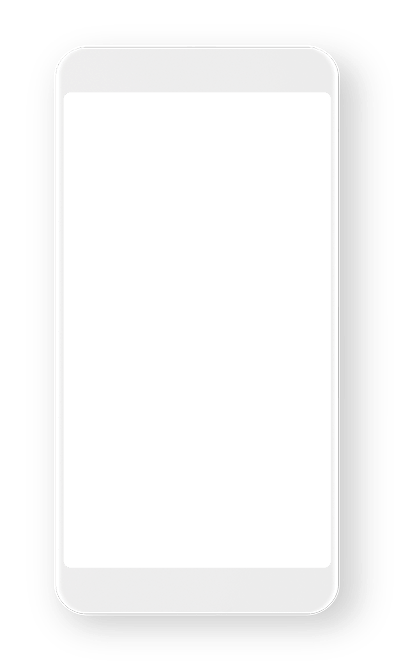 Its GIF teasers caught attention, its Retweet to Remind helped ensure views, and its chatbot offered people a deeper engagement with the brand and the event. 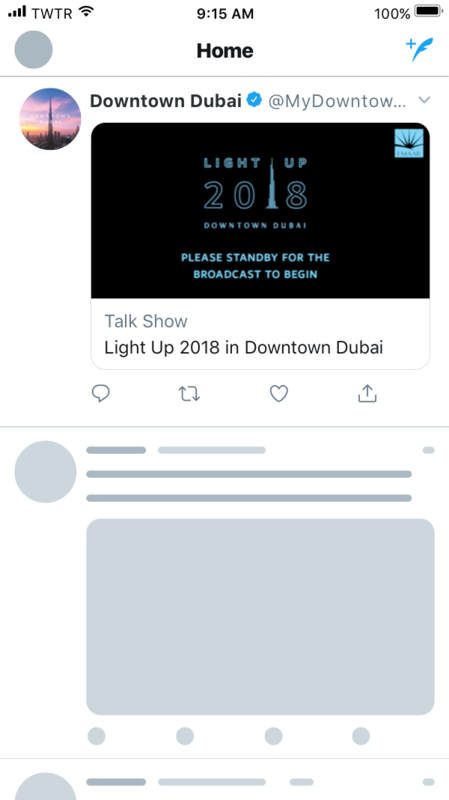 By using the Direct Message Card to promote its chatbot both before and after its show, ‎@MyDowntownDubai made it simple for people to converse directly and meaningfully with its brand. ‎@MyDowntownDubai’s streaming gave ‎#LightUp2018 a live, global audience. The celebration became the center of a real-time international conversation. By sharing video highlights of ‎#LightUp2018, with its Tweets and through chatbot greetings, ‎@MyDowntownDubai maintained the momentum of its ‎#MyDubaiNewYear campaign. This follow-up strengthened the connection it had made with its global audience, and helped the campaign reach even further. The mesmerizing laser, light and musical fountain show not only had a spellbinding effect on spectators, but Emaar's 'Light Up 2018' also clinched the Guinness World Records title for the 'largest light and sound show on a single building’. ‎@MyDowntownDubai achieved great success in terms of views, as well as engagement before and after its New Year’s Eve live stream. ‎#LightUp2018 was seen live on Twitter by 1.5 million unique viewers, five times the previous year’s viewership. The audience expressed its appreciation for the show with over 132,000 hearts during the streaming. Over the course of the campaign, people mentioned the hashtag ‎#MyDubaiNewYear 41,000 times. ‎@MyDowntownDubai’s chatbot received 3,600 messages in just five days before the show, and people used it to send over 1,500 greeting cards afterwards. Live-streaming on Twitter, supported by a phased campaign and a variety of creative formats, enabled Emaar to invite a global audience to Downtown Dubai for NYE 2018. By sharing our celebration, we inspired new audiences with the wonder of the Burj Khalifa and the beauty of Dubai.